FVP’s next quarterly workshop is coming up on April 29th. This will be a Hands-on Workshop with plenty of individual attention. It is for novice bloggers who want to get started or those who are uncomfortable with what their content should be and/or how to attract readers. 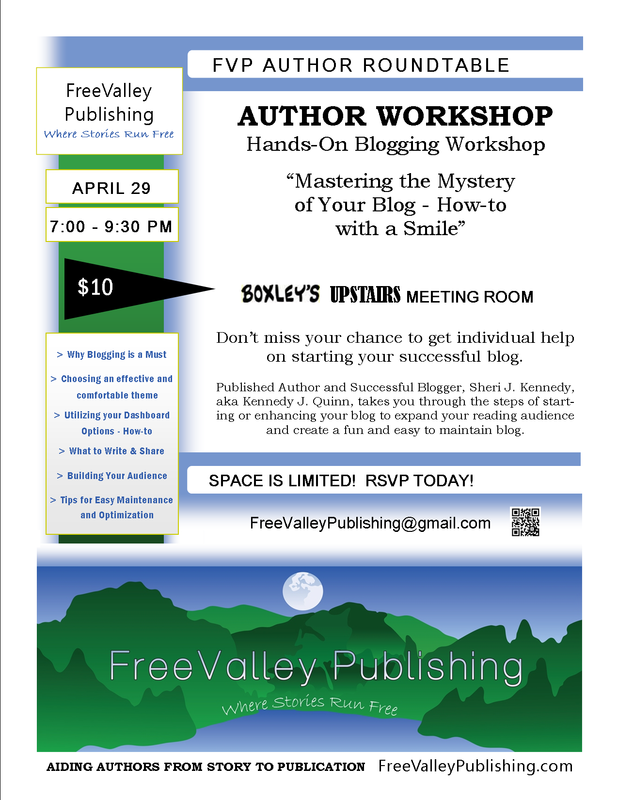 If Blog is a scary word that you as a writer or author know you need to face, this is your workshop! Presenter Sheri J. Kennedy, aka Kennedy J Quinn, is a published author, successful blogger and the editor of the FreeValley Publishing blog you are visiting. Her teaching takes each participant from where they are and shows them the tools to progress toward where they’d like to be. She has found a surprising amount of pleasure in blogging and will share her enthusiasm and tips to make it a fun part of building your writing career. This entry was posted in Events, News About FreeValley, Writing Workshops by freevalleypublishing. Bookmark the permalink.